Back in May, Michigan had three cornerback prospects committed to play football for the Wolverines. Now they have zero. With Garrett Taylor being the last decommit, it was time for the coaching staff to start recruiting the position all over again. On Monday, 2015 ATH John Kelly received a scholarship offer from the coaching staff. Kelly, who is rated as the #31 Athlete in 2015, has a short offer sheet consisting of mostly Big Ten, and MAC schools. Most notably in his offer list is Michigan State, and Minnesota. Although listed as an athlete by most recruiting databases, John will be recruited as a cornerback by the Michigan coaching staff. In my opinion, Kelly is a very intriguing prospect and extremely underrated. Only rated as a 3* prospect by Rivals, Kelly’s highlight film features some very impressive plays. He’s an all-around good football player, with a high level IQ. Although he doesn't possess high end top speed, he does have a good enough burst to out run a lot of defenders. John has excellent cuts in his runs, getting him more open in space with the ball. On the defensive side of the ball, he keeps his hips open to the play, making him more susceptible to making tackles or even interceptions. His ball skills could be some of the best in the entire state. In my mind, his field awareness is what makes John such a good football player. He constantly knows where the ball is going and is always in the right position to make a play. As a running back, Kelly ran for 1,200 yards and 15 touchdowns last year. 2015 commit Darrin Kirkland Jr. will be visiting Ole Miss this Saturday, when the #4 ranked Rebels take on the #3 Auburn Tigers. The atmosphere in Oxford will surely be intense, and the Ole Miss coaching staff will look to show off their impressive team to the young linebacker. Darrin also will be heading down to Norman, Oklahoma next weekend for an official visit when the Sooners take on the Baylor Bears. In some more current recruit news, 2015 Safety commit Tyree Kinnel will be taking an unofficial visit to West Virginia this weekend with current high school teammate Robert Landers, and his high school coach. Although Tyree is visiting a different school this weekend, I still really like the Wolverines chances to land the talented defensive back. Tyree has stated in the past that he does love Michigan, and this visit could be nothing more than just hanging out with a high school team mate at a college football game. It's long been known that 2015 Tight End commit Chris Clark would be looking at other schools, in case Brady Hoke lost his job. Well, Chris booked three official visits earlier this week. Chris's first visit will be on November 14th to North Carolina. Chris had committed to North Carolina in March for a brief period of time, and has since kept a good relationship with the coaching staff in Chapel Hill. His second visit will come on November 28th when the USC Trojans take on the Fighting Irish. USC has recently made a major push for Clark's services, and at this point I think if Chris was to decommit, USC would be the likely landing spot.His other visit will be to Texas on December 5th after the Longhorns season has ended. Keeping Clark in the fold will be extremely difficult at this point, as all signs look for major changes this off season. Come National Signing Day, I would put Chris's chances at signing a Michigan Letter of Intent at slim. Chris is Michigan's highest rated remaining recruit according to 24/7 composite rankings, as he is rated the #2 Tight End, and the #77 overall prospect in 2015. In case you missed it earlier this week, 2015 CB Garrett Taylor decommitted from Michigan. 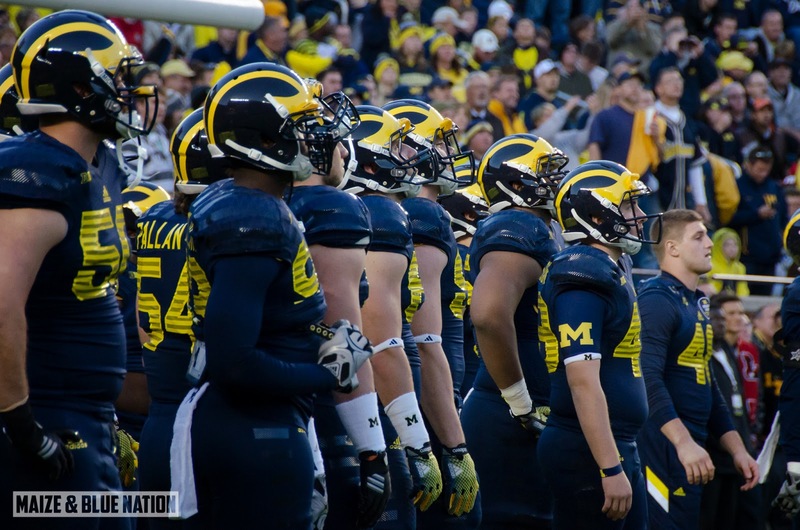 Per Steve Lorenz, Taylor will not be looking to recommit to Michigan either. Garrett has official visits Ohio State, and Penn State booked for November. Personally, I think Virginia Tech is no his leader and I think he will end up playing in Blacksburg for his collegiate career. 2016 Quarterback commit Messiah deWeaver was offered a scholarship by the Duke Blue Devils on Wednesday. This was Messiah’s first scholarship offer since committing to the Wolverines back in June. 2015 Defensive End/Outside Linebacker target Keisean Lucier-South will be in Oregon this weekend for an official visit. 2015 Wide Receiver Grant Perry received a scholarship offer from the Nevada Wolfpack on Wednesday. 2016 Linebacker David Reese will be in attendance this weekend when the Wolverines take on the Hoosiers. This will be David's fourth visit to Ann Arbor since June. 2016 Offensive Lineman Michael Jordan will also be in Ann Arbor for an unofficial visit this weekend. 2016 Wide Receiver target Dez Fitzpatrick committed to Louisville on Friday morning. He had a 24/7 crystal ball reading that favored Michigan 50%.